Former Luton midfielder Lawson D’Ath has signed for League Two side MK Dons. The 25-year-old, who was released by the Hatters in the summer after making 26 appearances and scoring once in his 18 months at Kenilworth Road, has agreed a one year deal with the Dons. 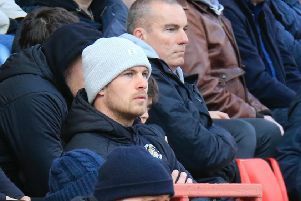 D’Ath links up with new boss Paul Tisdale, who he played for in a brief loan spell with Exeter City during the 2012-13 season, and speaking to the club’s official website, said: “I’m delighted to be here. “I can’t wait to get going and get the season started. “I’ve played under Paul before and I know what he’s about and how he wants to play football. “It’s how I want to play. I’m just looking forward to working with him again. This season, we need to be competitive, robust and fluid team and Lawson provides us with those qualities. Tisdale added: “Lawson is a forward-thinking midfielder who can play in a number of different positions. “He’s also had experience in this division in the last three years. “This season, we need to be competitive, robust and fluid team and Lawson provides us with those qualities.